Oh my gosh, it is so much fun to have a little girl. My first was a boy so I’ve spent years with Spiderman, Batman and all things superhero. “Frilly and pretty” were foreign to me until recently. Never thought I’d be so girly, until I had my daughter. All of a sudden, me…Miss Neutral, became obsessed with all things pink. My baby girl still doesn’t have a lot of hair but I love glamming her up with pretty hair accessories. My favourite are from Angel Lily, an adorable collection from entrepreneurial mom, Ly-na Toye. Her bows are not only fashion-forward, they are super baby safe. All bows are a minimum of two inches in length, making them difficult to swallow. 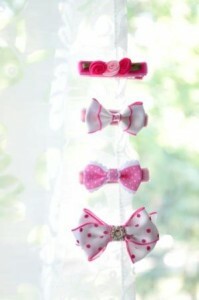 The glue used for the designs is toxic-free and the bows’ metal clips are lead-free. Plus, baby-fine hair won’t be pulled or damaged thanks to the soft velvet that encases each metal clip. Bows stay in place for hours, ensuring that our little darlings always look their best!